Shibase’s solo exhibition forms part of the 2018 KZNSA Gallery’s Social Art Programme. The exhibition is constituted of selected works from previous exhibitions and new works by the Durban-based artist. In this exhibition, Shibase consolidates a range of his thematic interests, predominantly his preoccupation with visually exploring the interrelatedness of themes such as power, masculinity and violence. Shibase’s work critically engages African patriarchal culture. Ideals of authority, power and dominance have given rise to a society based on male sexual entitlement and the abuse of women in the private realm, and dictatorial violence and corruption in the public realm. The medium of paint is at the centre of his visual exploration of the aforementioned themes. Push & Pull is concerned with two aspects: Firstly, the physical process of painting itself, such as layering and de-layering of paint on the surface; and secondly, the contradictory theoretical positions we hold in relation to the above-mentioned themes but more specifically – power. 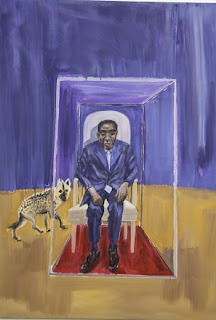 The interrogation of how power is perceived is critically explored through his paintings in relation to the contexts of gender, sexuality and race politics. Shibase is an activist, and his bracing, yet harsh critiquing of the current shaky status quo is bound to make viewers question the premises upon which South African identity and politics are based. In his work, things are not what they appear to be, inviting viewers to engage critically with what they see. Shibase was born in Port Shepstone in 1980 and currently lives and works in Durban. 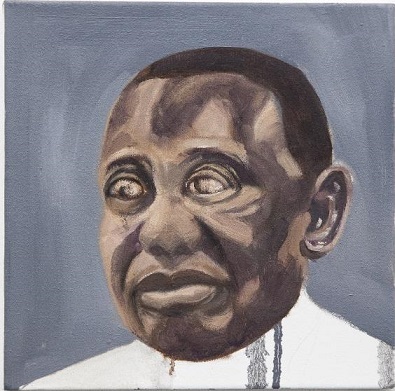 He completed his Master of Fine Arts degree at the Durban University of Technology (DUT) where he presently lectures in painting, drawing and art theory, whilst pursuing his PhD. Since 2005, Shibase has presented several solo exhibitions in Durban, Johannesburg, Cape Town and New York. He was nominated as one of the finalists for the MTN New Contemporaries Award in 2008 as well as the Spier Contemporary Award in 2007. Recent group exhibitions include Harboring Histories at Durban Art Gallery, Us at Johannesburg Art Gallery (JAG) and New Spell at David Krut in New York. In 2014, Shibase featured in After 20 Years, 20 Artists at the KZNSA Gallery, and he also took part in Dialogues with Masters: Visual Perspectives on Two Decades of Democracy, curated by Thembinkosi Goniwe as a special project for the FNB Joburg Art Fair. Shibase is a member of various organisations, including the African Arts Centre and the Arts for Human Rights Trust. Push & Pull runs in The KZNSA Gallery’s Main, Mezzanine and Media Galleries until March 10, 2019.